Is that garlic? Whatever it is, it must be part of the onion family and it looks alien but nifty! Looks like your shallots have gone to seed Sara. Yes! 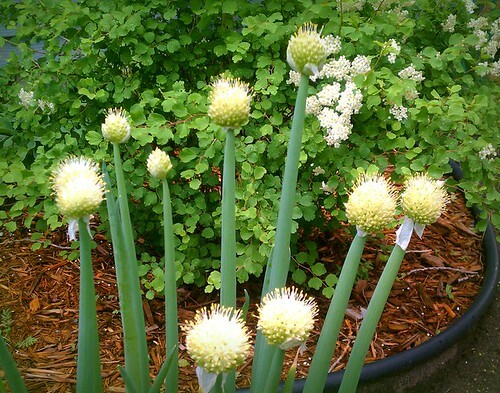 Apparently they’re called Walking Onions, or at least that’s how Husby knows them. When the big bloom gets heavy it falls over and plants more onions where it falls. I just like the looks of the blooms, kind of fuzzy and soft.